Thank you everyone who entered the 200 followers giveaway! I'm thrilled that we now have over 230! It's very exciting, and I hope people will get involved with commenting on posts. Look out for more giveaways soon, and some reviews coming up this week! Well, that's me back from holiday/vacation. I realised recently just how short the time is until the end of term. I also saw how many books I have that need reading - a lot of them wont be able to come back across to Scotland with me, so I thought I'd get them in order and see what I need to get done in the next six weeks! Most of these are things that I've almost finished with, so hopefully will be reviewing soon. Witchling, I've kind of given up on, because the writing really doesn't appeal to me, so I'm not finding the story very enjoyable. Iced, I'm just a few chapters in to, and Storm of Swords, I'm about half way through. None on my computer, but I have several review requests stacked up. I think, given the above amount of books, I'm not going to be taking any until I have this lot more under control, though. So there you have it. What do your tbr or currently reading piles look like? Once again, it's been a super busy week. I won't know until I pack my bag this afternoon and see how much space there is if my laptop is coming on vacation with me next week, so if it does, you'll get book reviews, and if not, then I will have plenty to share when I get back. Without further ado, welcome to Feature & Follow! 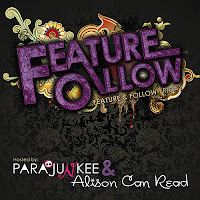 F&F is hosted by Parajunkee & Alison Can Read, and features a couple of bloggers every week. The question this week is: What is a book you didn’t like that all your friends raved about or what book did you love that wasn’t popular? For books I didn't like, I'm not sure. I wasn't a fan of Hush, Hush, but I think the audience is pretty split on that one - I'm not alone in not liking it. A couple of the blogs I usually get my romance recommendations from were raving about 'The Bro-Magnet', and I didn't get more than a couple of chapters in, and was scanning through that much - the main character just didn't appeal at all, I felt like he was a bit of an idiot. For books I like that aren't popular, I think it's not that people dislike books I've enjoyed, they just haven't heard of them. 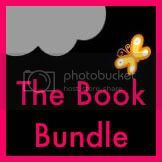 I guess that's a reason I like to blog - I want to share books I've loved with a wider audience. I was excited to find out that Maureen Johnson and Stephanie Perkins were doing a tour event in my town. Maureen was promoting her new book, The Madness Underneath, which is the 2nd book in her 'Shades of London' series. I loved the first one, and I've been following Maureen Johnson on twitter for a while - she's a very funny person to read on twitter, and was very much like that in 'real life' too. I went along, met up with some friends from my writing group, and settled in for what turned out to be more of a stand up comedy show. It was absolutely hilarious. They talked about funny travelling stories, including strange hotels they had stayed in. It won't let me rotate this, but here, Maureen demonstrates the 'glowing orb' version of a ghost, with the aid of Fox. After much hilarity, they took a couple of questions. I asked about their journeys to publication and how long it took, and Maureen said she liked my accent! That was kind of cool, but I think I was turning bright read. Yay! The store also gave out some fun Maureen-related stickers - I'll have to find good places to put them. It was a really fun evening, and if you get the chance to meet either of these authors, I'd definitely suggest it! I can't wait to read these books, and find out what happens next in the Shades of London series. To try and reach more people and find new blogs, I'm now doing Stacking the Shelves (hosted by Tynga) as well as continuing Letterbox Love (hosted by Kirsty). I only got two books this week, but they are both awesome. I was lucky enough to get to go to the tour stop for Maureen Johnson & Stephanie Perkins last night, and it was absolutely hilarious! I'll put up a post about it tomorrow, with pictures, which trust me you're going to want to see. It was just so funny! So I picked up a copy of Steph's "Anna and the French Kiss", as well as Maureen's new book, the one she's touring for, "The Madness Underneath". I loved the first book in the series, and I had a sneaky read of the first couple of chapters while we were waiting for them to arrive. I have no idea what this says after my name. It's been a quiet week on the blog because I've had college midterms and papers to deal with, but things will be better next week! Welcome to this week's Feature & Follow post! FF is hosted by Parajunkee & Alison Can Read. If you're stopping by from the hop for the first time, please take a look around, and feel free to follow on GFC or by email. It's been a quiet week because I haven't had reading time, but next week we should be back on track with reviews being posted during the week. Any followers should also check out the 200 Followers Giveaway, which is open through March 16. Where are all the reviews? I just wanted to let you all know that reviews will be back very soon - I have midterms and papers due this week and next, so I just haven't had any reading time recently. After next week we get in to spring break though, and I have a whole bunch of books that I'm almost finished reading that I want to talk about here. So, hang tight, there will still be Feature & Follow tomorrow, and a Letterbox Love/Stacking the Shelves post over the weekend and next week, and the reviews will be back very soon!